Young people do not like Donald Trump nor Hillary Clinton very much, a new GenForward poll finds. Trump’s ratings among young minority voters are especially dismal, as many millennials believe the presumptive Republican nominee is racist. The poll indicated that 19 percent of young people view Trump positively while 75 percent dislike him. Clinton, who has struggled to capture the millennial vote in this election, fares a bit better than Trump with 39 percent favorability and 54 percent unfavorability in the same age group. Among ethnic groups, young whites have the best views of Trump at 27 percent. Only 6 percent of African-American, 10 percent of Hispanic, and 12 percent of Asian-American millennials see the Republican candidate in a positive light. The poll found that most young Americans oppose his race-related immigration proposals, adding another layer to the perception of Trump’s racism. Seven in 10 people disagree with the Muslim ban and the building of a wall, and six in 10 believe illegal immigrants should stay in the country. Despite Trump’s problems with minorities, the poll shows Clinton also does not garner racially diverse support. 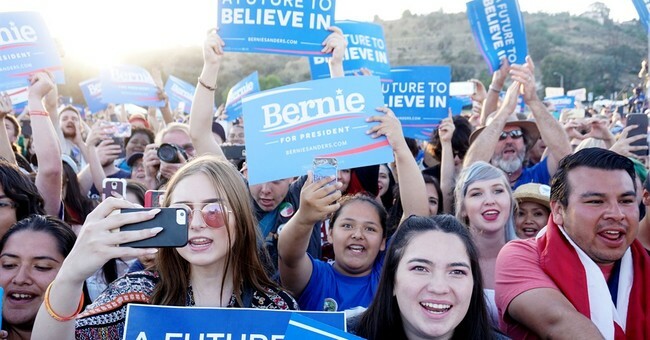 Young people of all races had largely supported Bernie Sanders over Clinton, but that may begin to change given the Vermont senator’s endorsement of Clinton on Tuesday. The poll—taken in late June—shows 55 percent of whites and 70 percent of minority voters view Sanders favorably. Perception of Clinton is more mixed: she has 64 percent favorability among young blacks but only 26 percent favorability among young whites. NPR compared Trump and Clinton’s low numbers to the two previous presidential elections, when young voters’ support helped propel Barack Obama into office. “Obama bested Romney 60 to 37 percent among 18- to 29-year-olds in 2012, and he beat McCain 66 to 32 among this group,” NPR reported. GenForward, in partnership with the Black Youth Project at the University of Chicago and the AP-NORC Center for Public Affairs Research, polled nearly 2,000 adults ages 18 to 30 from June 14 to 27. The margin of error is 3.8 percent.